It's tiny and crowded in the peak of summer, but Cassis is simply gorgeous. Often referred to as the 'poor man's St Tropez' this small town in the South of France snuggles timidly beneath majestic mountains, just a short drive from Marseille. You can do the entire town in an hour, although you will want to stop and linger in one of the myriad cafes and bistros lining the small port. 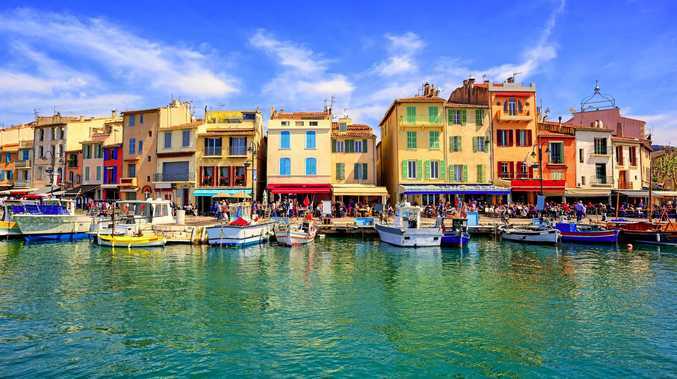 Obviously, tourism is booming in Cassis, it's very popular with the French, and the town's leaders have ensured the place looks its absolute prettiest with baskets of vibrant flowers hanging from lamp-posts around the port. All the boats crammed prow to prow in the harbour look ready to sail you into your Mediterranean dreams. The small municipal park, complete with duck pond, is pruned and manicured to perfection. I repeat. Cassis is gorgeous. The festive atmosphere around the harbour is infectious. From 10 in the morning through to midnight, buskers, acrobats and accordionists perform in front of the cafes (and then bring the obligatory hat around), and the procession of people promenading bubbles along day and night. 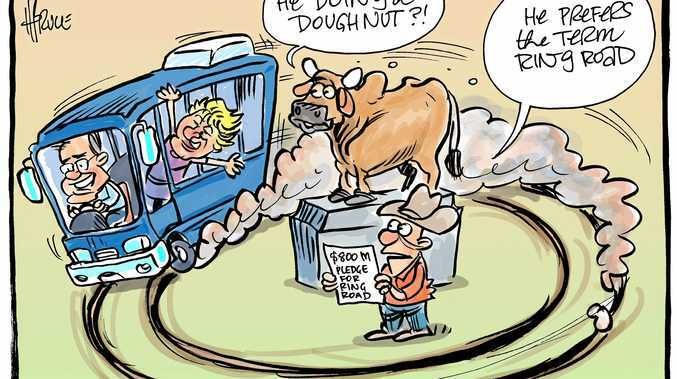 Surprisingly for such a booming resort town, reasonably-priced hotel accommodation can be found for around $120 a night, right in the middle of the buzz of the port (most hotels have double glazing, so a good night's sleep is assured). Restaurants can be pricey if you want the big deal, but 'formula' menus (usually two or three courses for around $20) can be found on blackboards outside every eatery. Moules (mussels) and frites (fries) are a must-try, every place serves them, even the tiny pizzeria will offer a big bowl of mussels and fries for around $12. 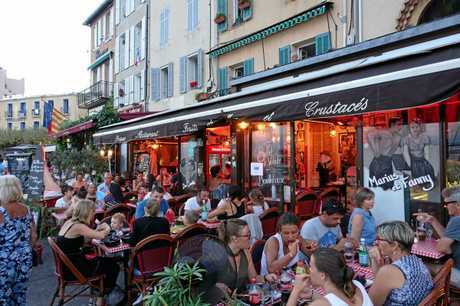 The maze of back streets away from the port are awash with bistros and cafes, their tables and chairs out on the narrow streets, their offerings from the very grand bouillabaisse to the humble Nicoise salad. Market days on Wednesdays and Fridays take the town's vibe up several notches with stalls packed into every street, square and park, offering local crafts and products, and, always, the essential cheeses, saucisson, tapenades, and nougat. A pebbly beach behind the tourist information centre is popular (renting a sunbed rather than sitting on hard pebbles is recommended) but if you really want swimming at its best - in translucent, deep water - you must get to the nearby Calanques. These are narrow inlets, like fjords, running between Cassis and Marseille. 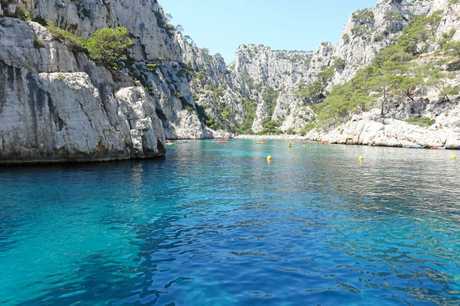 Boat tours from Cassis will take you to all nine of the Calanques, or just three or six of them, your choice. One of the tours stops to allow for 45 minutes of swimming. If you are fit enough you can hike to the inlets and then climb down the rocky faces of the cliffs, perhaps better to hire a kayak, or do as we did, rent a small boat. We tootled to the third inlet where a tiny beach was barely visible beneath the mass of tanned bodies. We dropped anchor away from the beach and spent a memorable afternoon jumping into the deep, blue water. It was a swimming experience like no other before. Cassis has a long history. The Romans found it very much to their liking 2500 years ago, as did the Phoenicians. A handsome castle still crowns the hill above the port and dates to the 8th century. It is lit at night and makes a beguiling sculpture to look up to while you eat your moules by the water. When you think it's time to leave this delightful small place where everyone is happy and determined to eat and drink and make as much merry as they can, take a drive in the surrounding hills through vineyards and wineries. St Tropez might have more than its share of fancy yachts and beautiful people but we reckon Cassis has more heart.